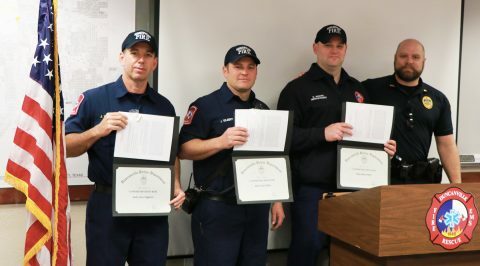 In addition to their full-time jobs with the Duncanville Fire Department, Captain Jason Wigginton, Firefighter Brent Nabors, and Firefighter Jared Gilbert also serve as the Duncanville SWAT Team Medics for the Police Department. On February 14, 2019, the Duncanville Police Department presented Police Commendation Bars to the SWAT Team Medics for the firefighter’s outstanding contribution to law enforcement and assistance at the biennial Active Shooter training held last year. As partners in public safety, the police and fire departments rely heavily on each other’s professional skill sets during emergency incidents. In September 2018, the Duncanville Police Department SWAT Team conducted Active Shooter training in an abandoned hospital facility in Waxahachie, Texas. The firefighters provided vital medical training to police personnel over the course of three training days, including casualty assessment, formations of rescue teams and how to properly care for the injured. The close partnership and cross training efforts ensure that police and fire personnel are better prepared if an incident were to occur in Duncanville. On Tuesday, February 5, 2019 the Duncanville City Council approved the issuance of $20.735M in general obligation bonds at a rate of 3.12%, which is 3/10 of a percent lower than projected, saving the City approximately $800K over the life of the bonds. The bonds were sold at a premium, allowing for the City to realize the full $21.6M in project proceeds authorized by the citizens. The bond issuance is a result of the November 2018 general election where Duncanville voters approved four bond propositions for various park, street, fire and facility projects. The low interest rate is credited to the City’s strong fiscal policies, experienced and stable city management, solid AA bond ratings and overall healthy local economy. The rate is fixed over the life of the bond and represents a savings of approximately $40K per year as compared to projections. Funds are expected to be available in early March. The City of Duncanville’s water is safe to drink, but opportunists are trying to convince residents otherwise. The City of Duncanville has received several reports regarding recent social media posts from a company called “Test My Water”. The posts target unsuspecting residents with sensational claims and graphics about water, then offers free in-home water tests. The company works through third party vendors to provide water tests, who then up-sell residents with water filtration products and services. Duncanville drinking water continues to be rated as “superior” by the Texas Commission on Environmental Quality. For more information regarding water quality, or to have a City of Duncanville Water Utilities professional test your water, please call 972-780-4900. This company and related partners are not working on behalf of the City, and do not have permission to use the City logo, letterhead or other City branding. Residents are encouraged to be careful with online advertising from “Test My Water” and other unsolicited water filtration businesses. City of Duncanville is currently accepting applications to test for the position of EMT-Paramedic or Firefighter/EMT. Applicants must meet the minimum qualifications as listed below at the time of hire to be considered. To apply please visit www.duncanville.com/departments/fire/recruitment and complete the information. Interest to take the test must be received no later than 5 pm on Friday, February 22, 2019. Must be a minimum of 21 years of age and shall not have reached their 36th birthday. Certified as an EMT-Paramedic or Licensed Paramedic by Texas Department of Health and Human Services OR Basic Firefighter by Texas Commission on Fire Protection AND EMT by Texas Department of Health and Human Services. Must possess (or be able to possess) a valid class A or B Texas driver’s license and have a good driving record. Applicants with prior employment as a Firefighter/EMT- Paramedic in the State of Texas may receive credit for previous experience; resulting in higher starting pay. Please see city website for further details. The entrance examination must be completed within two and one half hours and will consist of a written examination from which the eligibility list shall be established and will remain in effect for a one year period unless list is exhausted first. Veterans with Honorable discharge status with a copy of DD214 will receive 5 additional points. In the event of identical grades, the test administrator will break the tie in the following order: 1) Highest raw test score 2) EMT-Paramedic certification by Texas Department of Health and 3) Draw numbers. Top 15 scores on the written exam will take the Physical Agility test the same day immediately after the exam. The location is Fire Station 2, 1530 S. Main Street, Duncanville 75137. Entrance exam will consist of basic reading and math comprehension. You may obtain a study guide at www.bannonandassociates.com. On January 24, approximately 50 residents attended the Town Hall meeting for the Kidsville/Splashpad projects at Armstrong Park. Overall the concept plan was well received by residents who attended. Several concerns and questions were raised that the City will continue to review and address in the planning process moving forward. Examples include shade, restrooms, security, and ancillary amenities such as water fountains and benches. 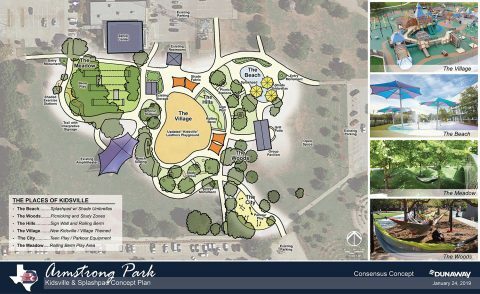 The preliminary concept plan for Armstrong Park was shown at the meeting; however, the only projects currently funded are replacing Kidsville and adding a Splashpad. Future items will be constructed in phases as funding allows. The next step is for the concept plan to go before the Park Board for recommendation to City Council, possibly in March. Project updates will continue, and for questions please email parksandrec@duncanville.com.